This UHINOOS Work Apron is designed to provide convenience for people to work. 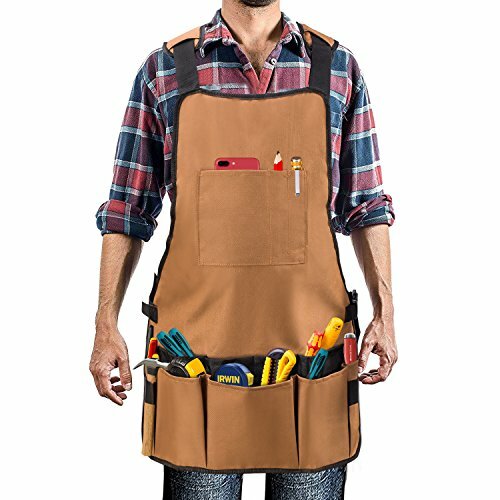 So with this Work Apron, you could Get the job done more efficiently. Constructed from high quality 600D oxford canvas, long lifetime durable in use. Adjustable straps give you freedom to choose the tightness as you like. Fully protect your safety to set your family's minds at ease . ADJUSTABLE STRAP FITS ALL SIZE: The Padded shoulder and waist straps are adjustable to fit men and women (XS-XXL) . There are no restrictions on people of all sizes. Perfect for Self-use or giving away. MULTIFUNCTIONAL POCKETS ORGANIZE YOUR TOOLS: With 16 tool pockets, you can quickly organize your tools, such as scissors, wrenches, hammers, screwdrivers, knives, steel rules and whatever you have in tool box. And double layer hammer loops, this is a convenient design for lefties and righties workers. MADE OF HIGH QUALITY MATERIALS: For better performence, we used 600D oxford canvas which is waterproof and scratch resistant. This oxford canvas is light and soft but extra durable to hold heavy tools. KEEP THINGS YOU NEED STORED WITH YOU: This working apron helps saving your time and energies. This design make the tools readily available. All you need to do is take it out which means you don't need to spend time rummaging among tool boxes. ERGONOMICALLY-DESIGNED AND EASY ON/OFF: Comfortable and air-permeable material make you won't feel stuffy even in summer. Sturdy oxford canvas prevent sharp objects stabbing effectively. Also it's easy to put on/off, just unsnap the button on the waist belt, and lift over your head. If you have any questions about this product by UHINOOS, contact us by completing and submitting the form below. If you are looking for a specif part number, please include it with your message.